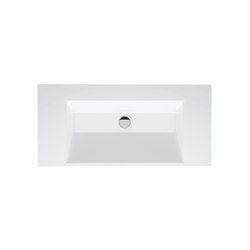 Steeped in tradition, BETTE, the German Premium Manufacturer for enamelled titanium steel bathroom components, brings a soft touch along with newfound comfort to the powder room. In 2017 it is, unexpectedly, not the Italians but the Danes who are telling us which way the trend is going. And the buzzword here is ‘hygge’, denoting warmth, comfort and security – qualities we all desire and seek out. We can find this primarily at home: in the kitchen, the living room, the bedroom and, yes, now also the bathroom. 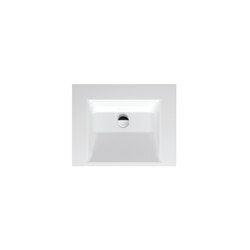 The bathroom industry, too, is attempting to serve the need for a new, decelerated lifestyle-rhythm. Some of the approaches it is taking are interesting and abstract – at first glance provoking grins of amazement, but mainly piquing our curiosity. When we consider a material like enamelled steel, after all, it isn’t the notion of domestic comfort that most immediately comes to mind. Yet this traditional material isn’t so far removed from cosiness as one might think, as the Delbrück-based enamelled steel specialist Bette demonstrates. 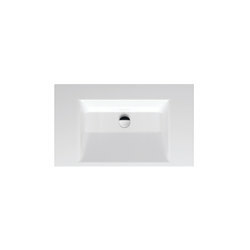 In a new bathroom series, Bette has perfectly united the advantages of two contrasting components, showing that they indeed belong together. 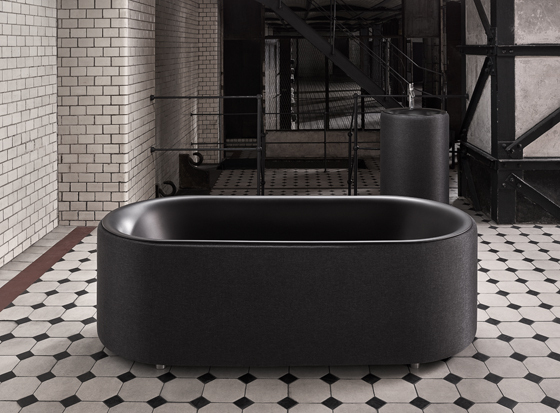 BetteLux Oval Couture, designed by Dominik Tesseraux of Tesseraux + Partner of Potsdam, consists of a bathtub and a circular washstand – on the face of it, a classic combination. 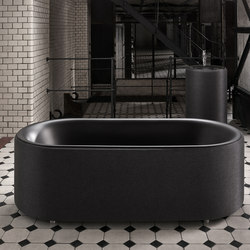 But these two compact pieces made of glazed titanium steel, which evince a formal clarity of line and renounce all that is extraneous, possess a unique and convincing feature: they are clad in a fully encircling cushion that appeals strongly to the sense of touch. Two solitaires, each in an elegant fabric dress, so to speak. 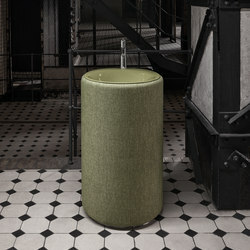 This unusual combination of metal and cloth has already conquered the bathroom and no doubt set a new quality standard. 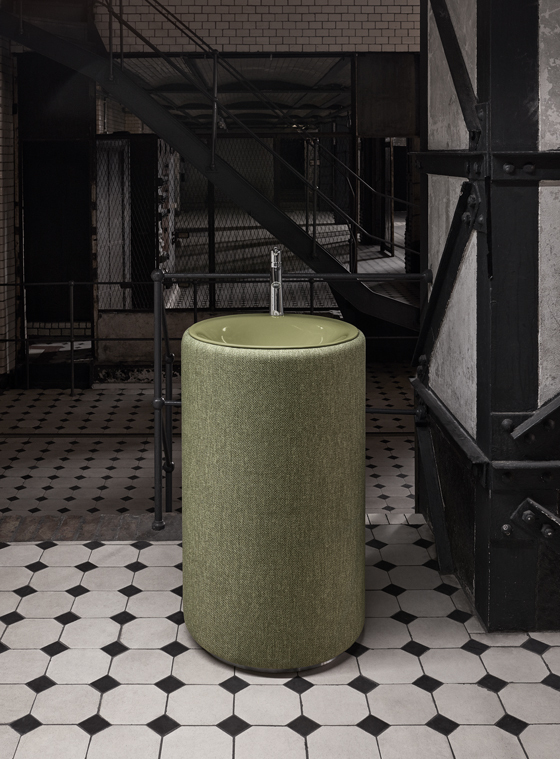 In a successful collaboration with the textile label Jab Anstoetz and the upholstery experts at the Bielefelder Workshops, an exploratory prototype was produced for the Salone del Bagno 2016 in Milan. 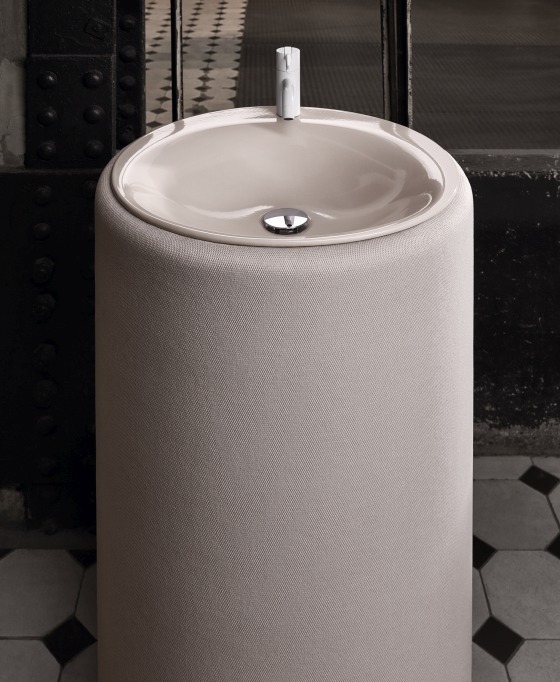 This has since been developed to the production stage: the aprons, enclosed in fabric and padding, make a smooth transition into the body of the tub and washstand, and meticulously elaborated details leave no doubt as to the functionality of this extraordinary mix of materials. Cool elegance and a warm, sensual look play off of each other thanks to the tested functional fabric (mould-, weather- and climate-resistant and fit for outdoor use), the narrow, overlapping seam edges (only possible in this precision with enamelled steel) and the connection to a robust stainless steel frame. 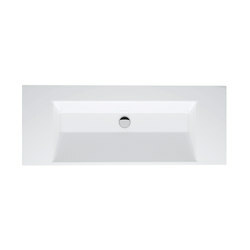 The deliberately archaic quality of the BetteLux Oval Couture collection gives the bathroom more than a new face. 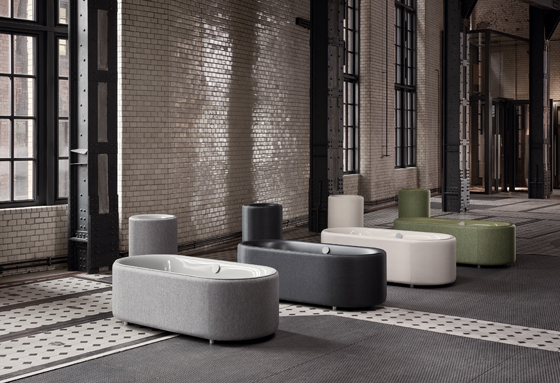 It fundamentally changes the bathing experience – on the one hand through the haptic encounter with the fabric, which is perceptible by the whole body, and on the other through the completely new acoustics that the upholstery introduces. Personality and individuality figure prominently here as well, in the colour selection of Ivory, Moss, Carbon and Elephant (mottled grey) and the possibility of using different colours for the fabric and the enamelled steel. The focus on the essential, interpreted through new stylistic means, is beautifully successful. Especially given that the trend barometers call for increasing residential comfort, this Bette project represents a courageous step, an unusual response to questions of the zeitgeist. 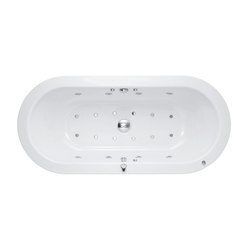 The seductive quality of the tub and washstand, which maintain sober forms, perhaps ultimately lies in their suggestion of the soft, warm comfort of a sofa that invites one to linger and relax. In use, pleasantly warm water and the feeling of being cosily enveloped in cloth take care of the rest. 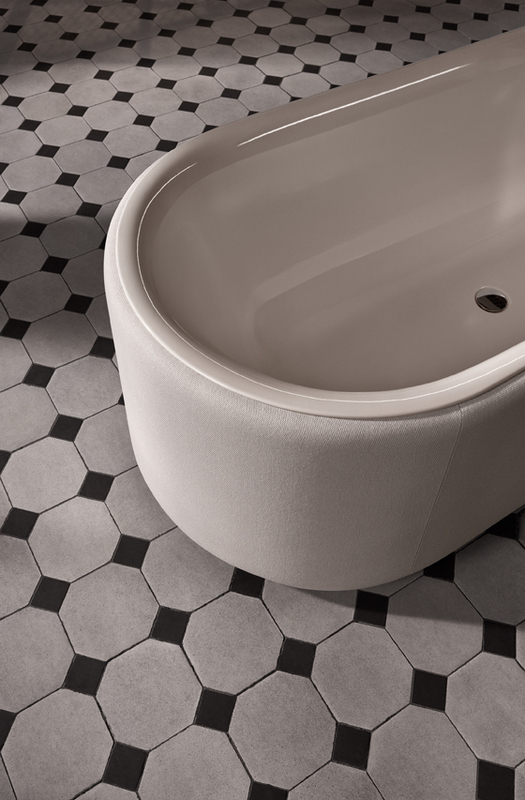 Not least, the shadow gap at the base creates the illusion of the tub and washstand floating just above the floor, which counters the weighty impression made by the objects’ compactness. Bette has created elements with a strong, unique character. 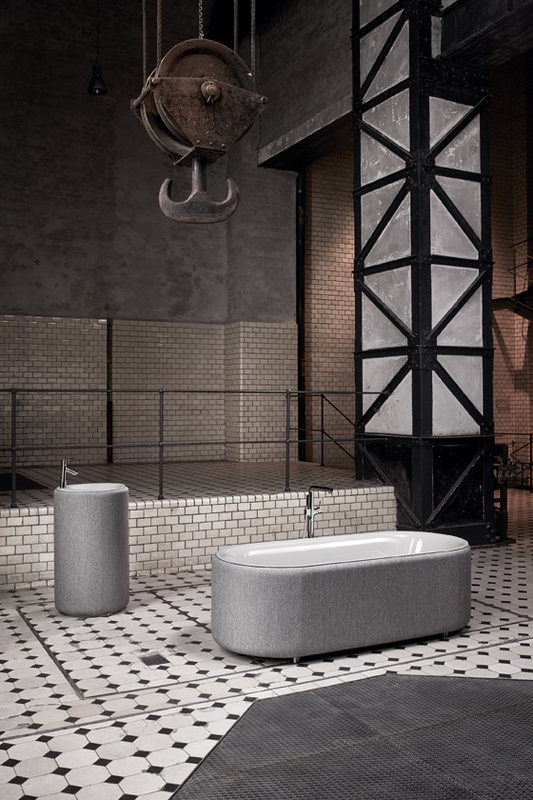 While they harmonise wonderfully with one another as a congeneric duo, the freestanding bathtub and washstand both have a presence as objects that allows each to be used independently. The formal assonance, which affords great design freedom, proves to be a forward-looking concept that renounces all overstatement. The pure, unadorned shapes make an impression of noble reserve, with the cushioned fabric fleshing out the elegant enamelled steel. Thus arises a perfect balance between the two materials, which combine to bring forth a new species of furniture – one clearly destined for great things.